Institute of Management and Technology (IMT), Enugu in Affiliation with University of Nigeria, Nsukka [UNN] Degree Admission Form, Courses, Application Guidelines, Screening Subjects, Dates, Time and Venue for 2018/2019 Academic Session. 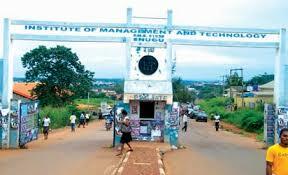 The Institute of Management and Technology (IMT) , Enugu in affiliation with University of Nigeria Nsukka (UNN), commences sales of application forms for 2018/2019 academic session. The screening is for candidates who scored 180 and above in the 2018/2019 Unified Tertiary Matriculation Examination conducted by Joint Admission and Matriculation Board (JAMB). Interested applicants are advised to visit the IMT Portal via portal.imt.edu.ng and click on ONLINE PORTAL​. Then click on APPLY at top-right hand corner of the website. Candidates can also pay using their credit cards through IMT Quick Teller link: https://www.quickteller.com/IMT ,select Screening Exam Fee​ as the payment option. All applications must be filled and submitted on or before Wednesday, 14th November, 2018 as the application window closes on that day.